The Targa model name of deep-vee aluminum fishing boats is not new for Tracker Boats, but all three 2011 Targa models are radically changed and this particular V-18 DC (dual console) model certainly is totally new and is all about serious big water fishing. So serious was Tracker in getting it right that they enlisted the help of 25-year, big water tournament fishing professional, Gary Parsons, to offer suggestions for the Targa’s layout and execution (see separate article). The most obvious change is the Targa’s hull size. Yes it’s longer at 19’1” overall, but its beam is a huge trailer-maximum legal towing width of 102” (8’6”) or 2.59 m! The resulting increase in interior roominess seems enormous. The bottom width of the hull increases to 88” (2.2 m) for a much more planted ride and greater stability at rest while the “V” of the hull bottom increases to an unusually deep 20° deadrise for an even smoother rough-water ride. A reverse-chine design also aids ride and handling characteristics. In addition, a new transom set-back design is said to deliver undisturbed water to the propeller for faster, smoother takeoff and better overall performance. The transom itself is a tall 25” (63.50 cm), box-beam, corner-brace construction which can accept a gas or electric kicker motor. What you won’t necessarily pick out is the 2-piece, all-welded .100 5052 marine aluminum hull construction with a welded-in aluminum longitudinal stringer system injected in the void areas with expanding foam to provide extra hull stiffening, flotation, and a quieter ride. What you will notice are the new extra wide 11” (27.94 cm) gunnels with vertical full-height inner panels all aiding in structural strength and rigidity and with non-skid aft step pads on top. Look closer at these gunnels topside and you’ll find unique access doors to top-loading storage boxes each suitable for quick access to rods up to 8’ (2.44 m) long. Below these are closed side-access storage areas on both sides for rods up to 7’ (2.13 m) long. Also new for Tracker in 2011 is its exclusive VERSATRACK® accessory mounting channel in the gunnel. 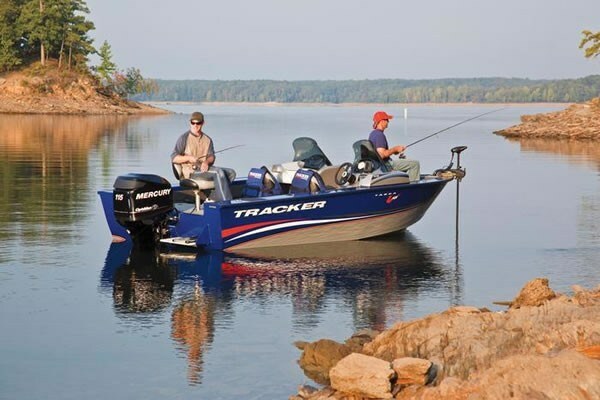 For seating, Tracker provides a dedicated helm seat with slide adjustment plus two movable fold-down 360°-swivel fishing seats and six pedestal seat base locations. Padded backrests in front of each console provide stretching out comfort in the raised bow area. The helm and passenger one-piece molded consoles with tinted windscreens provide storage/cooler areas plus the AM/FM/CD stereo w/MP3 jack on the passenger side and a functional dash/control panel complete with multi-function gauges, a sport, tilting steering wheel, flush-mount compass, Lowrance® Mark-5X fishfinder with a 480 pixel screen and fishfinding to 800’, all as standard equipment. Extra space on the dash has been thoughtfully reserved for a larger screen, GPS, or both. Storage abounds on the new Targa. The elevated bow fishing deck provides two tackle trays in the bow panel plus bow storage nets, two deep bow storage compartments, and a center bow box for rods up to 7’ (2.13 m) long. There is another large in-floor center storage compartment plus another in the aft raised fishing deck. 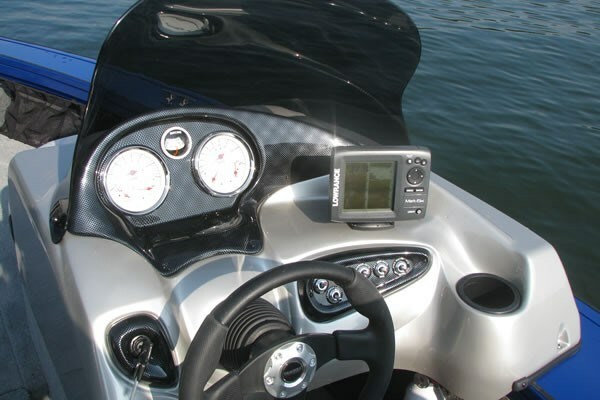 The standard cranking and trolling batteries have separate storage midship and aft. A 2-bank, 4-amps per bank battery charger keeps the juice flowing. 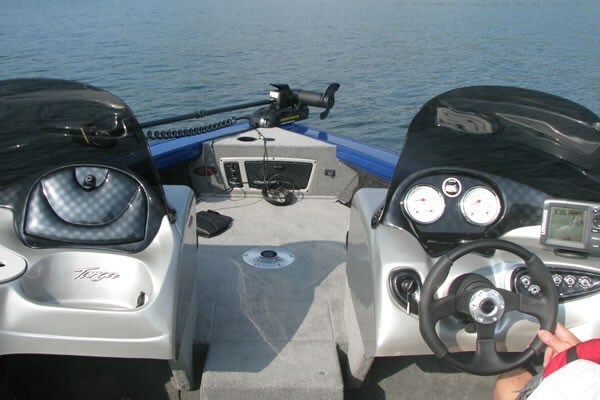 The bow panel has a trolling motor receptacle, bow aerator switch, trim switch and is fed by a 24-V trolling motor harness for the standard Minn Kota® 24-V, 70-lb thrust, 54” (1.37 m) shaft, PowerDrive™ foot-control trolling motor. Two molded one-piece rounded-corner livewells, each with a 500 GPH aerator pump w/timer and a 500GPH recirculating pump w/timer will protect your catch. The bow livewell is 19-gal (71.92 L) and the huge aft livewell is 55-gal (208.20 L). Both have baitwell inserts. A factory-matched, colour-coordinated, powder-coated, swing-away tongue, drive-on trailer w/tongue jack is standard as is a Mercury 90 hp EXLPT OptiMax® outboard motor. Boatdealers.ca reviewed this all-new Targa V-18 DC at man-made Table Rock Lake, Missouri, located just outside Branson and south of Tracker Marine Group’s Springfield facility. 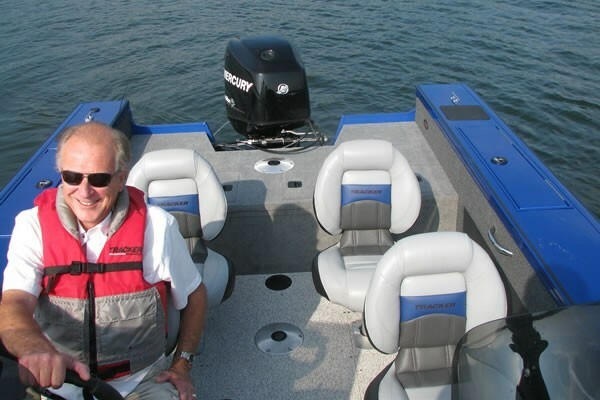 The test boat was equipped with the optional Mercury 115 hp EXLPT (extra long shaft, power trim & tilt) OptiMax and we spent the total allotted time not only to explore the beautiful scenery of the lake, but also to ensure a thorough shake-down of the boat. And what an impressive boat it is. The V-18 is almost instantly on-plane where 3000 RPM saw 16 mph on GPS. A little more throttle to 4000 RPM produced 26 mph, and full throttle trimmed out 5400 RPM was 36 mph. The 4000 RPM at 26 mph seemed to produce a satisfactorily quick yet very comfortable and probably reasonably economic cruising speed. Even multiple criss-crossing back and forth through its own wake didn’t fizz on this Targa. It was totally impressive in all aspects of handling and was appropriately quiet with absolutely no bad habits. It was a joy to drive. There is no doubt that Tracker has done its homework well in designing and building this new series of big-water fishing machines. And if you need to extend the seasons, you may want to consider the Targa V-18 WT (walk-thru) with full windshield and available full canvas, or for added family enjoyment, the Targa V-18 Combo, designed for a combination of family-fun and fishing. Whichever one you choose, you are guaranteed lots of great times on the water.